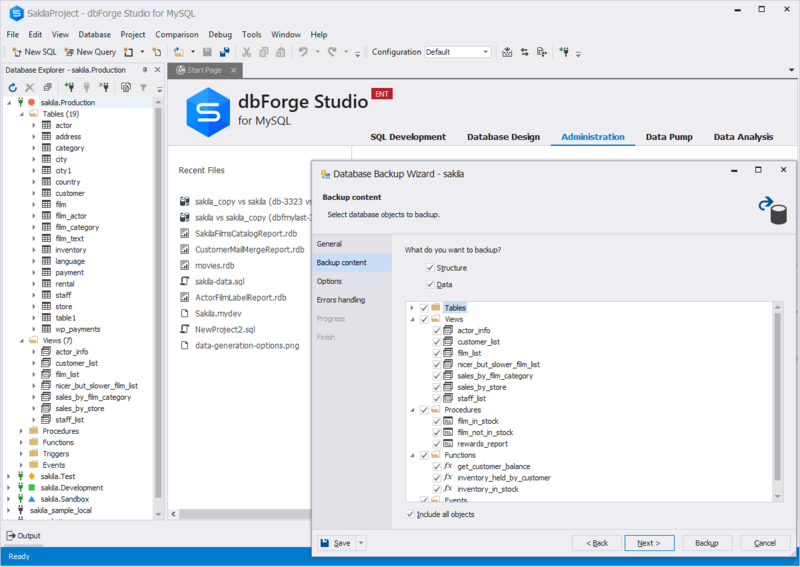 MySQL dump tool is a part of dbForge Studio for MySQL to help developers backup and restore MySQL databases with the maximum quality and speed. As a MySQL administrator, you will surely enjoy the tool as it will save your time and effort when performing MySQL database backup tasks. How to Backup MySQL Database through GUI? 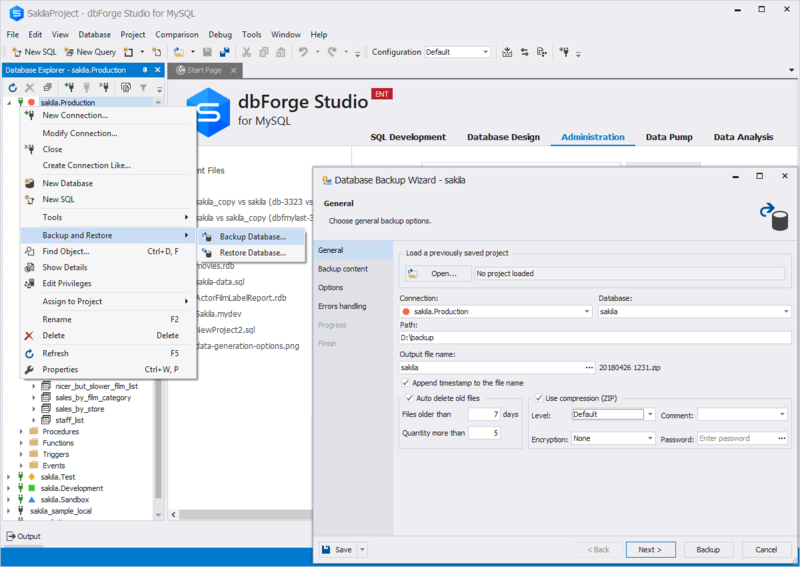 The following example will show you how to backup MySQL databases using the GUI. 1. 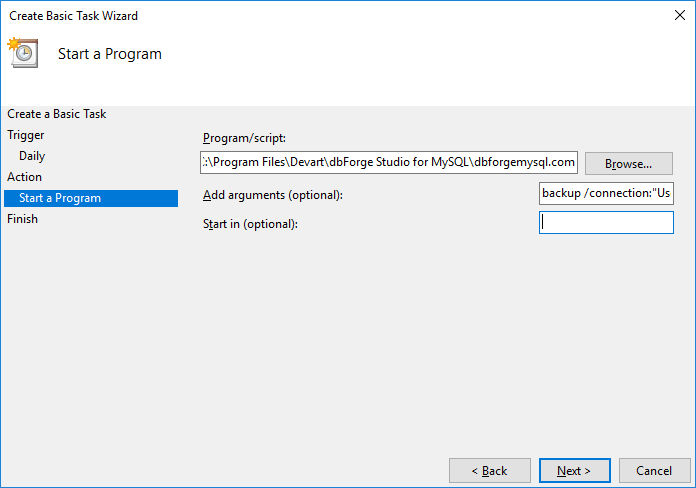 Right-click the required database in the Database Explorer window and select Backup and Restore → Backup Database option. The Database Backup Wizard opens. 2. On the General wizard page, specify a connection, a database to backup and a name for the output file. Click Next. 3. Select backup content. Click Next. 4. Specify detailed options of how MySQL backup should be performed. Click Next. 5. 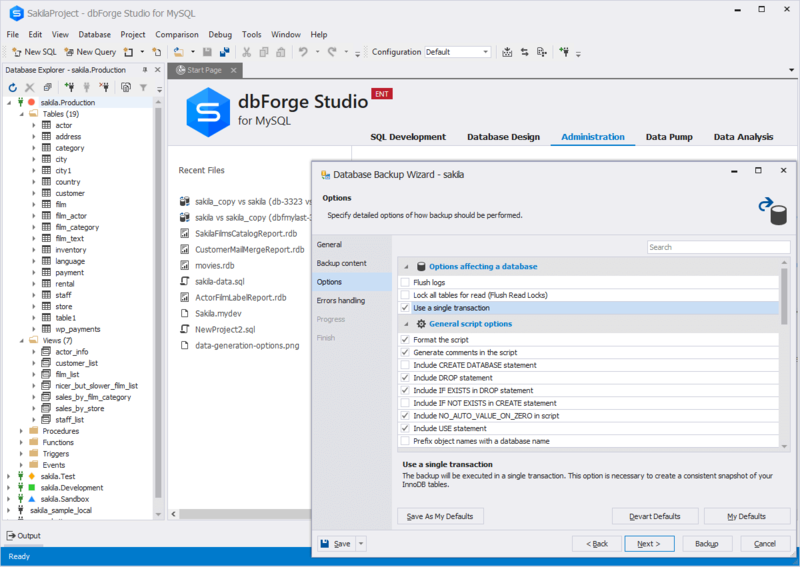 Specify Errors handling and Log settings options. Click Backup to start the backup process. 6. When the backup is complete, you can view the log file and view the backup file in the folder specified. 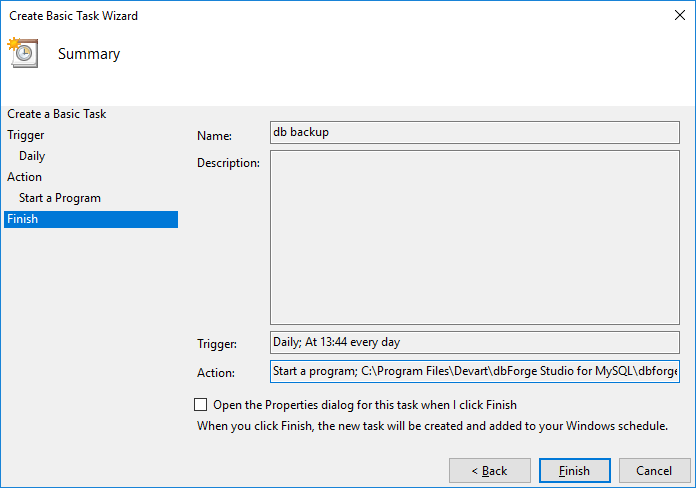 Click Finish to exit Database Backup Wizard. How to Schedule MySQL Backup? 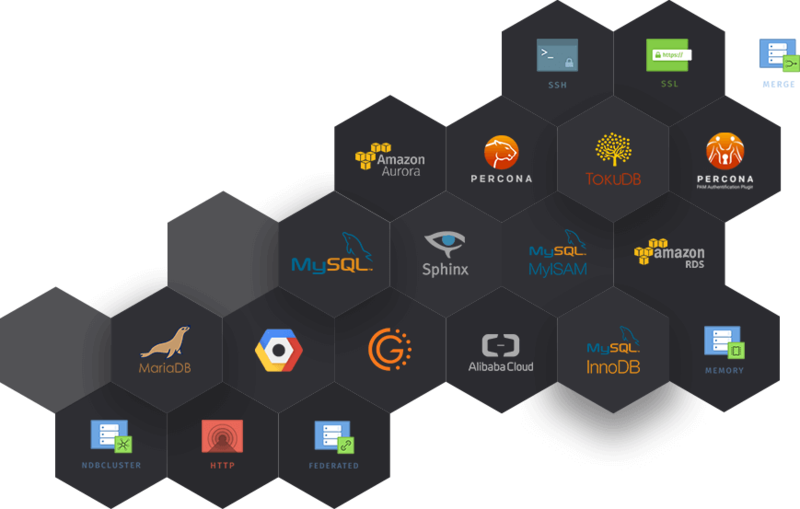 You may need to schedule an automated MySQL database backup that will recur periodically. To do this, first of all, you will need to create a project file, containing backup settings with the help of the MySQL backup tool. Once the project file is created, you have to schedule Windows task that will perform actions at a specific time or when a certain event occurs. 1. Complete the steps 1-5 above. Click Save Project. 2. Once all the needed options for the backup selected and the project file was saved, start Task Scheduler for Windows. 3. Select Action → Create Basic Task in the top menu. 4. Provide a name for the new task. Click Next. 5. Select one of the options when you want the MySQL backup task to be started. Click Next. 6. Select time and frequency for starting the task. Click Next. 7. Select Start a Program and click Next. 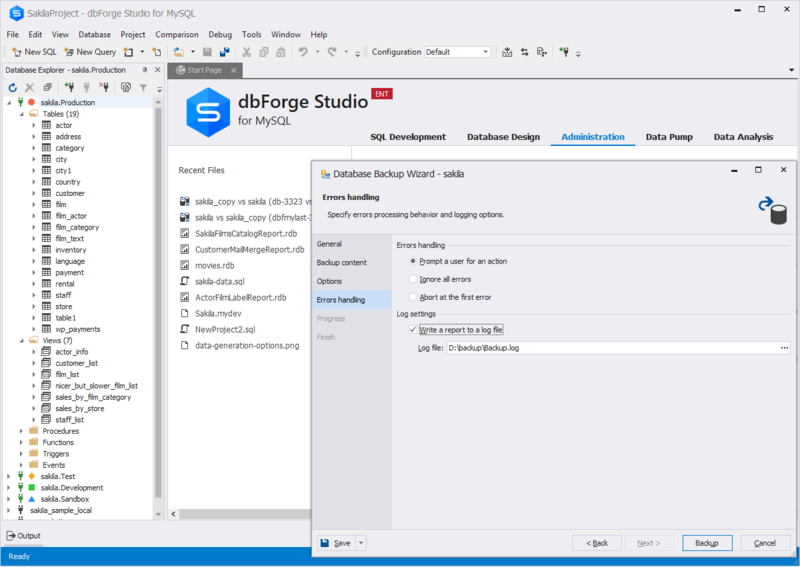 /backup /connection:"User Id=root;Host=db;Port=3309;Database=sakila;Character Set=utf8;" /projectfile:"C:\Users\Documents\dbForge Studio for MySQL\Export\sakila.backup"
9. Check all specified settings once again and, if no changes are required, click Finish . Otherwise click Back and make the needed changes. With our MySQL backup tool you can avoid the data loss by performing a full database backup or a backup only of selected database objects easily in just a few simple steps and restore it afterwards as easily and quickly as it was backed up. There are many things you can do with MySQL Dump Tool in addition to the above-described. You can select any of five levels to compress your files, use auto delete of old MySQL backup files to free your disc space, and set extended options for a database to export, backup structure, users, or a script. Unlike binary MySQL backup process, database is dumped in SQL format. Save your settings along with connections as a project for the next time or for use in the command line interface. Our MySQL backup tool can be used as a full replacement of MySQL Dump command line tool.